It's been a very weary couple of weeks. I feel like we are in a prelude to a nuclear winter, with multiple snowstorms per week. Thankfully in mid-Feb, we had a thaw, where the temps got up to 70 degrees one afternoon, so that all helped to reduce the towering snowbacks all over New England. Two weeks of sun helped to calm the cabin fever restlessness that always happened during the dark days of winter. I finally came to the conclusion, as much as I am a die-hard New Englander, I need a more moderate climate during the wintertime. I can see why the snowbirds have to leave the winters and go South. 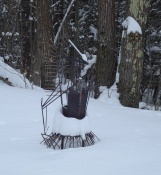 The last round of snow ( 3 storms in 5 days) left a good foot of snow and as you can see from the pics above, my welded sculptures are in danger of disappearing into the snow. My bird is 3 feet tall and he's just about buried in snow. Every day I look out and see how much of the bird can be seen or not. He's sort of my unofficial snow level indictator. As for hedgehogs, I thought I was just happy to have Cal Jr, my 2 year old boy, but unexpectly, another hedgehog came home with me. He is Forrest Gump, from the greater Worcester MA area, and he needed a new home. Apparently, his former owners weren't too happy with him, but they left him alone all the time. No wonder! A hedgehog breeder, Jennifer Crespo of Crespo's Crazy Critters had taken Forrest Gump from his previous owners and I was the only one on Facebook who was willing to take him. Forrest Gump is about a year and half old, very huffy, but he's gotten more comfortable with me. He'll never be like Cal, who is so laidback, Cal can't be bothered to even huff. Now I have two boys to enjoy, quills and all. As for work, it's been in spurts and fits. During the stormy weeks, I'm too weary to get much done, but when the weather is calm, I can get more done. Been working on an old idea but new designs based on the idea. Multiple rings soldered together in a 3-D form, so that it is very sculptural. I also have been making more earrings with stones, often with cool multi-colored glass cabs. I've gone back to stonesettings with a venegance, since I have so many stones, I gotta set them all. You'll be seeing more of them as this year goes by. My purple stones pendant did sell, to a great friend, so I'm happy.